Video Hate Squad! : COLE JUSTICE | Birth.Movies.Death. 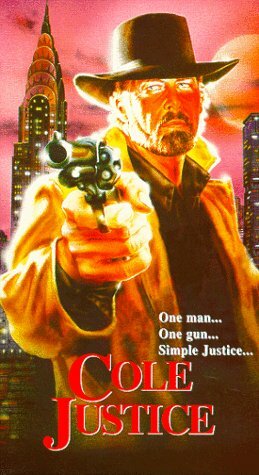 Zack delivers another VHS treasure with Carl Bartholomew's COLE JUSTICE. Well, until not much, really. Our terminally relaxed protagonist is drinking at the local bar, and some newer variety rogues (they now come with earrings) get too comfy with a waitress. Old emotions are stirred and Cole falls back into the blazing fires of rage, transforming into a wrecking ball of wrath. Meaning he puts on a cowboy hat, slips into a long duster coat and shoots some jerks. Though The Lady Godiva Bar is packed with witnesses and Cole appears to be a regular, no one is able to identify the man who the press creatively dubs "The Killer Cowboy." After his favorite student falls victim to a bad batch of new dope ("Crack, I think they call it..."), our hero sets forth on an aimless suicide mission of freelance lawmaking. Every felonious turd in Oklahoma finds himself facing the circular end of a well-oiled six-shooter. Dealers, rapists and generic thugs are ventilated, stabbed and – in one particularly effective scene – hanged from an apartment patio. The film is charmingly crippled at multiple levels, but there’s no suspension of disbelief that will allow for one fact: Cole’s disguise consists of a jacket and a hat. Yet his alter ego remains a complete mystery to friends, enemies and authorities. It’s a greater shrug-inducer than Clark Kent/Superman and Prince Adam/He-Man combined. But the shameless impossibility of it is what makes Cole Justice function as a contemporary wild west fantasy by and for post-middle-aged uncles who never got to make the difference they dreamed of. And that grips the viewer more than the attempted plot. This salted chunk of late '80s Tulsasploitation is a truly fascinating combination of vengeance and vanity from a visibly exhausted 57-year-old male. The one-time-only writer/director/star clearly put everything he had into his modern day action-western; it's just that he didn't have a whole lot to begin with. And all snarking aside, it's impressive to see a man his age grab hold of his personal project and wrestle it into reality against all odds and taste. Low end trash purveyors RaeDon Video normally trafficked in sleazier fare, but must have respected Bartholomew's drive (if not his talent), and allowed this earnestly creaky regional actioner to squeak through with an uncharacteristic minimum of graphic assault and bloodshed. The filmmaker passed away in 2009, and though most people wouldn’t consider Cole Justice to be much of a legacy, he saw his vision through and dumbasses like me are still talking about it after he’s gone. 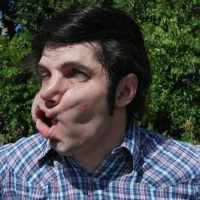 Carl Bartholomew, we salute you. Alamo Drafthouse Raleigh: VHStival Is Coming Back! What If IT CAME! And Nobody Saw It? August 30th – September 1st, be ready! A very obscure direct-to-video flick used a rather common bit of genre titling. A look at the distinct underrepresentation in the horror anthology.